The Saxophone is a harsh mistress. She demands attention every day. A musician friend once quoted to me: “Skip a day and you know. Skip two days and your friends know. Skip three days and everyone knows.” That quote keeps me practising nightly. My work on OpenStack has me travelling a bit more than I have had to for other software projects. While companies have been willing to send me to conferences in the past, only OpenStack has had me travelling four times a year: two for the Summit and two for mid-cycle meetups of the Keystone team. Keeping on a practice schedule while travelling is tough, sometimes impossible. But the nature of the places where I am visiting makes me want to bring along my horn and play there. The Kilo OpenStack summit was in Paris in November. 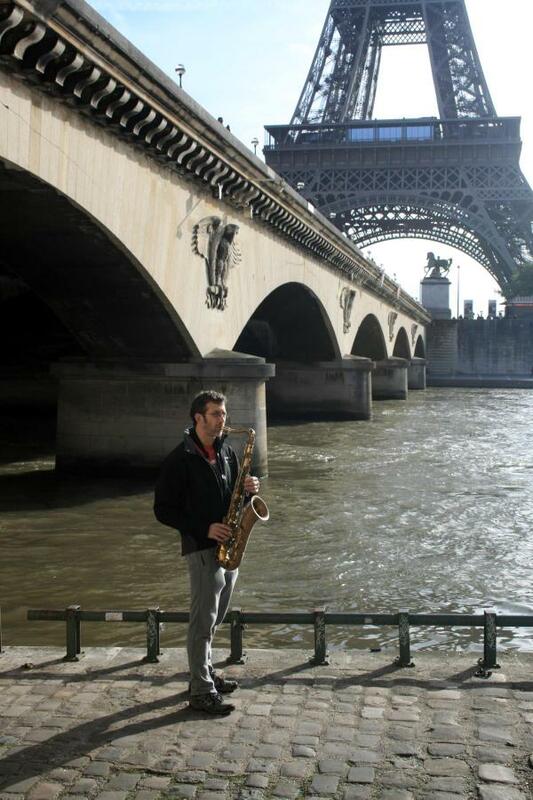 The thought of playing in Paris took residence in my imagination and wouldn’t leave. I brought the horn along, but had trouble finding a place and a time to play. The third night, I decided that I would skip the scheduled fun and go play in the middle of the Arc de Triomphe, a couple blocks away from my hotel. There is a walkway under the traffic circle with stairs that lead up to the plaza. However, a couple of police stationed at the foot of the stairs made me wonder if playing there would be an issue, and I continued on. As I approached the far end of the walkway, I heard an accordion. The accordion player spoke no English. I spoke less French. However, his manner indicated he was overjoyed to let me play along with him. I shut my case to indicate that tips would still be going in his box. I was certainly not playing for the money. He struck up a tune, and I followed long, improvising. It worked. He next said the single word “Tango” and I kicked started one off with a growl. Another tune, and then he suggested “La Vie en Rouge” and I shrugged. He seemed astounded that I didn’t really know the tune. This would be the equivalent of being in New Orleans and not knowing “When the Saint’s Go Marching In.” I faked it, but I think his enthusiasm waned, and I packed up afterwards and headed back to the hotel. I got one other chance to play on that trip. Saturday, prior to heading to the airport, Jamie Lennox and I toured a portion of the city, near the Eiffel tower. Again, I wasn’t playing for the money, and I didn’t want to gather crowds. 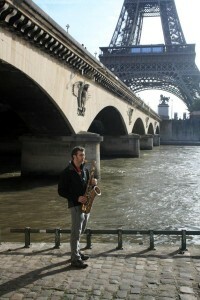 So we headed down to the banks of the Seine and I played near a bridge, enjoying the acoustics of the stone. 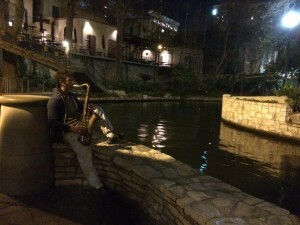 The Keystone midcycle happened in January, and I brought my Sax again. This time, I played each night, usually in the courtyard of the hotel or down along the Riverwalk. The Keystone gang joined me one night, after dinner, and it was gratifying to play for people I knew. On the walk back to the Hotel, Dolph and Dave Stanek (maybe others) were overly interested in their cell phones. It turned out they were setting up ww.opensax.com. Nice job, Adam. I always did like your style and enthusiasm…along with your great smile. Keep up the good work of bringing joy (music) wherever you may.